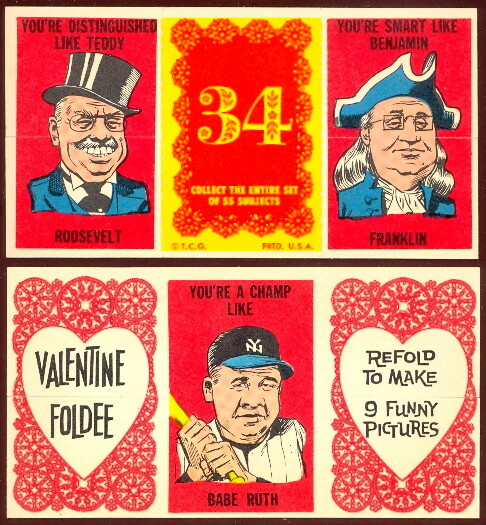 The 1963 Topps Valentine Foldees feature comical color drawings in a three panel format. The cards were meant to be folded in various ways and finding them in higher grade is difficult. Some of the famous people pictured include Babe Ruth (shown on 2 cards) John F. Kennedy, Jackie Kennedy, Caroline Kennedy, Richard Nixon, Dwight Eisenhower, Winston Churchill, Queen Elizabeth, Abraham Lincoln, George Washington, Franklin D. Roosevelt, Elvis Presley, Prince Charles, Thomas Edison, Cleopatra, Teddy Roosevelt, Benjamin Franklin, W.C. Fields, John D. Rockefeller, Sitting Bull, John L. Sullivan, and others. The set contains 55 cards and the cards measure 2-1/2" by 4-5/8".